If you make an interview about what is the most popular meal, you will receive a lot of answers «Barbecue». People just love grilled and smoked foods. Meats, fish, vegetables or bread, – all of them taste delicious when some fire is applied. If you are lucky enough to live in your own house with a backyard, you can do barbecue yourself and invite friends all year around! (Except for the time when it is snowing). People who live in own flats and do not have such wonderful possibility can still enjoy delicious foods made in one of the Best Electric Smokers. What type of electric smokers to look for? First of all, it needs to be simple in use; it has to be built according to the standards and be of a high quality. Other features such as size, color, and temperature you can choose depending on your own needs. 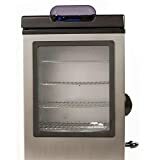 Char-Broil Vertical Electric Smoker has a double walled construction that allows you to maintain even temperatures through the whole cooking process. The handle is chrome-plated, and it will stay cool when the smoker is on. 3 iron cooking grates inside. The door is not tight enough. Bradley Digital 4-Rack Smoker has a fully digital control of the most important functions. You can easily regulate time and temperatures and select different cooking modes. 4 cooking racks can easily be cleaned. 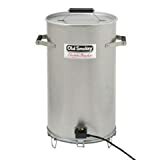 The smoker is made of a stainless steel and can keep smoke up to 8 hours giving food a unique and pure smoke flavor. The digital generator makes your food soaked with smoke. A door seal gets loose with time. Jim Beam BTDS76JB Bradley Smoke has 4 racks where you can fit all the food you want. A user-friendly interface allows you to easily adjust all the necessary settings such a cooking style, time, and temperature. If you are a fan of barbecue, then this smoker is exactly the choice for you. Heating elements have problems of work and wear out with time. 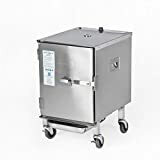 Smoke Hollow 30162E 30-Inch Electric Smoker has adjustable temperature control that allows you to cook your food exactly how you want it. Lots of space inside – you can feed a big family with this smoker. Doesn’t require heat monitoring, the temperature stays at the level you set. Everything is completely controllable. Let the smoker cook your meals itself. A built-in thermometer allows you to control food temperatures at every stage of cooking. Can not be built in. 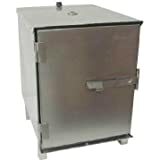 Smokintex 1100 Pro Series Electric Smoker is made of stainless steel. It is easy to use and clean. The smoker works when plugged into a 110-volt outlet the and uses the power of a 70-watt light bulb. It is a perfect size for a small family. The door is difficult to close. It doesn’t have a cover; you need to buy it additionally. Old Smokey Electric Smoker offers a variety of cooking modes and times. A lid on the top keeps all juices and smells inside, that’s why your food will come out very tender. Thermostat control prevents food from overheating or overcooling. Parts need to be replaced in the long-run. Masterbuilt 20072115 Bluetooth Smart Digital Electric Smoker, 30-Inch provides a lot of space for cooking. You don’t need to add any water. Bluetooth option allows you to control the cooking process from a distance. The food inside gives away juices that gather on the top and sides of the smoker and drip back on the food. The inner material is corrosion-resistant so that the smoker will serve you for a long time. For the Bluetooth to work you need to be within 10-20 feet of the smoker. Smokin-It Model #1 Electric Smoker can handle up to 22 pounds of meat at once. It offers users a variety of different cooking styles and timing. The racks inside can be taken out and adjusted. They are easy to clean, but you are still recommended to take out ones you do not use, this way you will save your time and effort. Separated racks allow you to cook several meals at once. A lid on the top makes all food juices drip back inside. Doesn’t fit for cooking big loads of food. Masterbuilt 20075315 Front Controller Smoker is good for both cooking newbies and professionals. Even restaurant chefs admire the Best Electric Smokers. The exact control of time and temperatures make your meals come out perfect. The control panel is equipped with a time function of automatic turn off. Your food will not be overcooked or even burnt even if you forget about it. Chrome coated racks are easy to clean, pans can also be taken out and put back inside every time you need them. Separate wood chip load allows you to add wood without opening the smoker’s doors. Children need to be supervised when cooking since the smoker’s surface gets hot. 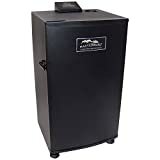 Masterbuilt 20070910 30-Inch Black Electric Digital Smoker has a comfortable control panel which allows you to regulate temperatures of your food. This smart smoker will not allow your food to cool down or overheat accidentally. It is energy-efficient and easy to work with. The meal will come out just in time and look as beautiful as on the picture. The lighting allows you to see the level of your food’s readiness. The smoker has wheels so you can easily move it around. No need to open the smoker to add wood chips, it has a separate wood chip load. It looks like this model doesn’t have any disadvantages. Having one of the Best Electric Smokers at home is a way better option than going to a restaurant every time you are up for some grill. Choose only the best smoker – you deserve it.